A natural lake is a fairly large body of water occupying an inland basin (low-lying geographic area). Lakes cover only about 1 percent of the continents, and contain less than 0.02 percent of the world's water, but they are important ecosystems and may be sources of water supply in certain regions. Lakes are extremely varied in terms of origin, occurrence, size, shape, depth, water chemistry, and other features. Lakes can be only a few hectares in surface area (i.e., less than a square kilometer), or they can be thousands of square kilometers. Their average depth can range from a few meters to more than a thousand meters. Lakes can be nearly uniformly round, or they can be irregularly shaped. Their water can be highly acidic (as in some caldera lakes), nearly neutral, or highly alkaline (as in soda lakes). Lakes can be low in nutrients (oligotrophic), moderately enriched (mesotrophic), or highly enriched (eutrophic). Lakes may be fresh-water or salt-water (saline). 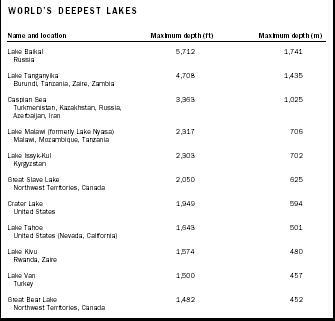 As shown in the table, most of the world's largest lakes are fresh-water, with some exceptions (e.g., Caspian Sea, Aral Sea, and Great Salt Lake). Fresh-water lakes contains less than 1 gram per liter of salt, whereas saline or hypersaline lakes, such as the Great Salt Lake (Utah), may contain more than 250 grams per liter. For comparison, sea water contains about 35 grams per liter. Saline lakes typically occur in arid climates, and occupy closed basins (low areas which lack stream outflow). Natural lakes can form by various processes. Although many of these processes occurred in the geologic past, lakes continue to form and to be destroyed. 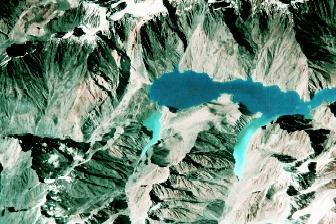 For example, an earthquake-triggered landslide created Lake Sarez in Tajikistan only three generations ago. In May 1980, Spirit Lake at the foot of Mount Saint Helens, Washington (USA) was greatly reduced in size when the volcano erupted, pouring rock, mud, and debris into the one-popular resort lake. Many lakes have formed as a result of tectonic movements of the Earth's crust. Lake Baikal, located in eastern Russia, formed in the Baikal Rift of the Siberian Platform. Lakes Tanganyika, Malawi (formerly Nyasa), Kivu, Turkana, Mobutu, Magadi, Naivasha, and Natron lay along the East African Rift Valley. Other crustal movements influencing lake formation include uplift of the seafloor (Caspian Sea and Aral Sea), and uplift around a central basin (Lake Victoria). The Basin and Range Province of the western United States contains tectonic lakes in the valleys between fault-block mountains (Lake Tahoe, California-Nevada border). Many Basin and Range lakes are remnants of larger lakes that existed 10,000 to 30,000 years ago, during the Pleistocene epoch (Ice Age). The Great Salt Lake, which covers 2,500 to 6,000 square kilometers (960 to 2,300 square miles) and is about 10 meters (33 feet) deep, is a remnant of Pleistocene Lake Bonneville, which covered 50,000 square kilometers (19,300 square miles) and was 300 meters (980 feet) deep. The 61-kilometer-long Lake Sarez was created in 1911 in the Pamir mountains of Tajikistan when a strong earthquake triggered a massive landslide that formed a huge natural dam. As of 2002, central Asian governments, the World Bank, the United Nations, and the United States Agency for International Development were considering gradually lowering the lake level to prevent catastrophic floods downslope and downstream if seismic activity were to cause a breach in the natural dam. during the Pleistocene epoch. Glaciers are large bodies of ice that form on land as a result of the accumulation and compaction of snow. As glaciers slowly move under the influence of gravity, they erode the landscape, leaving deep basins and valleys. The largest glacial lakes are the Great Lakes of North America (Superior, Huron, Michigan, Erie, and Ontario), and also Canada's Great Slave and Great Bear Lakes. Deposits of eroded glacial debris may disrupt drainage patterns. In the Alps of Europe, Lakes Geneva, Lucerne, Zurich, and Constance formed by glacial sediment damming valleys carved by glaciers. New York state's Finger Lakes formed by glacial sediment damming rivers and streams. Kettle lakes, common in the Midwest, formed as ice blocks melted in-place within glacial sediment. Lakes formed by volcanic activity tend to be relatively small. Lakes may form within the crater of an active but quiet volcano, in a caldera produced by explosion and collapse of an underground magma chamber (Crater Lake, Oregon), on collapsed lava flows (Yellowstone Lake, Wyoming), and in valleys dammed by volcanic deposits (Sea of Galilee, Israel). Many other types of lakes exist. In areas under-lain by soluble rock such as limestone, lakes may occupy sinkholes formed by dissolution of the bedrock. Dissolution lakes are common in Florida, as well as in Puerto Rico and in the former Yugoslavia, which are areas underlain largely by limestone. Erosion and deposition of rivers can form lakes, such as meandering rivers forming oxbow lakes. Some lakes are associated with levees on river deltas (Lake Pontchartrain, Louisiana). Lakes can form where landslides dam stream valleys. Wind action can form lakes, including deflation basin lakes formed by wind erosion (northern Texas, New Mexico, parts of Australia), and lakes in low areas between sand dunes (Sand Hills, Nebraska). Lakes may form along the coastline, where sediment deposition isolates an embayment (Coorong lakes, southeastern Australia). Meteorite impacts can form lakes (Lake Bosumtwi, Ghana; and Manicouagan Lake and Chubb Lake, Quebec). The origin of some lakes is unresolved, but much debated, such as the ellipsoidal "Carolina bays" on the coastal plain of the southeastern United States. Lake size and depth can change over time, owing to various reasons. Through natural processes, lakes will ultimately fill with sediment, thereby "evolving" into a terrestrial ecosystem. But human influences can accelerate the process. For example, Lake Chad, once one of Africa's largest bodies of fresh water, has decreased in size due to an increasingly dry climate and human demands for irrigation water. The Aral Sea in Uzbekistan has decreased from an area of 68,000 square kilometers (26,500 square miles) in 1960, to 29,000 square kilometers (11,200 square miles) in 1998. Beginning in the 1960s, farmers and state offices in Uzbekistan, Kazakhstan, and central Asian states opened significant diversions from the rivers that supply water to the lake, thus siphoning off millions of gallons to irrigate cotton fields and rice paddies. Consequently, the waterbody began shrinking and the concentrations of salts and minerals began rising. This has resulted in its dropping from the world's fourth largest lake in 1960, to sixth by 1985, and to tenth by 1998. The commercial fishing industry has disappeared, and today strong winds blow across exposed areas of lakebed, decreasing crop yields on arable lands that receive the salt-laden particles. The salinity of a lake can change over time. For example, the Aral Sea had a salinity of about 10 grams per liter (1.3 ounces per gallon) in 1960. In 1998, its salinity was about 45 grams per liter (6 ounces per gallon), and is now too salty to support the organisms that lived there previously. SEE ALSO Ice Ages ; Karst Hydrology ; Lakes: Biological Processes ; Lakes: Chemical Processes ; Lakes: Physical Processes ; Plate Tectonics ; Volcanoes and Water . Allen, P. A., and J. D. Collinson. "Lakes." In Sedimentary Environments and Facies, 2nd ed. Oxford, U.K.: Blackwell Scientific Publications, 1986. Frostick, L.E. et al., eds. Sedimentation in the African Rifts. Geological Society Special Publication No. 25. Oxford, U.K.: Blackwell Scientific Publications, 1986. Hutchinson, George E. A Treatise on Limnology: Vol. 1. Geography, Physics, and Chemistry. New York: John Wiley & Sons, Inc., 1957. Johnson, Thomas C. "Sedimentation in Large Lakes." Annual Reviews of Earth and Planetary Sciences. 12 (1984):179–204. The Aral Sea Homepage and Chronology of the Desiccation of the Aral Sea. German Aerospace Center (DLR) and German Remote Sensing Data Center (DFD). <http://www.dfd.dlr.de/app/land/aralsee/> and <http://www.dfd.dlr.de/app/land/aralsee/chronology.html> . 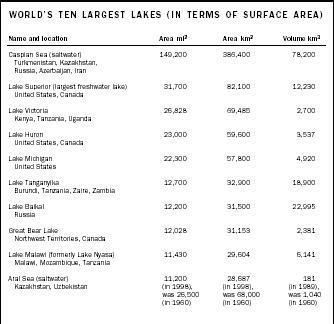 Survey of the State of World Lakes. International Lake Environment Committee Foundation. <http://www.ilec.or.jp/database/database.html> . Lake Vostok is one of more than seventy subglacial lake-like water-bodies known to exist under the central Antarctic ice sheet. Located under 4 kilometers (2.5 miles) of ice, Lake Vostok is roughly the size of Lake Ontario, one of the North American Great Lakes. Lake Vostok, whose existence was confirmed in 1996, is capped by ice, but does not freeze solid, perhaps because of geothermal heat rising from the Earth's interior, or perhaps because of the insulating effect (and the pressure) of the ice blanket. Ice samples from cores drilled close to the top of Lake Vostok suggest that the lake has been sealed under the ice sheet for more than 500,000 years. To prevent contamination of the lake, scientists deliberately halted the core roughly 150 meters (492 feet) above the presumed boundary between the lake surface and the overlying ice sheet. Lake Vostok may hold clues to whether life could survive in a dark extraterrestrial ocean, such as the slushy, subsurface water believed to exist on ice-covered Europa and Callisto, two of Jupiter's moons. Isolated from light and from the surface, Lake Vostok might hold evidence of cryopreserved life. The National Aeronautics and Space Administration (NASA) is developing a probe design that could melt through the ice and deploy a small submersible (a "hydrobot") to explore the liquid body of water beneath the ice blanket. The development and refinement of ultra-clean technologies to prevent contamination of the waters being sampled could serve as a model for a possible mission to Europa. I am interested in especially tectonic lakes and their biodiversity.